Friday Funny | Watts Up With That? It’s ok. It’s a DRY heat. Something is going nuclear at Sandia Labs. I just want to know how has a camera ready and sitting on the end-table in order to snap a quick photo of their TV…. That’s a great combination of planning AND skill for sure. Ok, hottest 6 months ever, the warmists have won, i give in. Looks like cooler July temperatures then when I lived there over 50 years ago. With the exception of Friday. delivered pizza will be hot. The temperature here (Southern NM) just dropped from 85 to 60 in a few minutes in our local thunderstorm. It rained 0.45 inches in about an hour. Damn. First two posts stole both of my jokes. Friday’s temperture forecast, is that celcius or farenheit? There will be a forest fire Special Report on Saturday. Quick – get those numbers to NCDC, NOAA, so they can give a boost to other station temps and keep showing how hot it is this year. We laugh, yet that number will make its way into the dataset and get extrapolated 1200 miles in every direction. 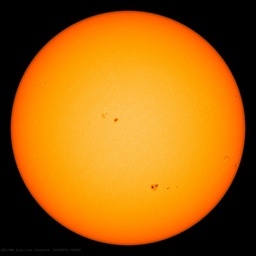 Expect a 2400 mile wide deep red dot on the next anomaly chart from NOAA. I guess this is on topic (I saw this Friday morning and thought it funny (in a macabre way)). On NH’s main commercial TV station, the AM news reported “Victim in fatal car crash improves.” There were two “victims”, they weren’t talking about the dead one. As this forecast comes from a model, you can BET that this record will be in the climate data base. After all, models DO provide data now. Climate science reminds me so much of the politician that promised above average income for every citizen if they vote for him. 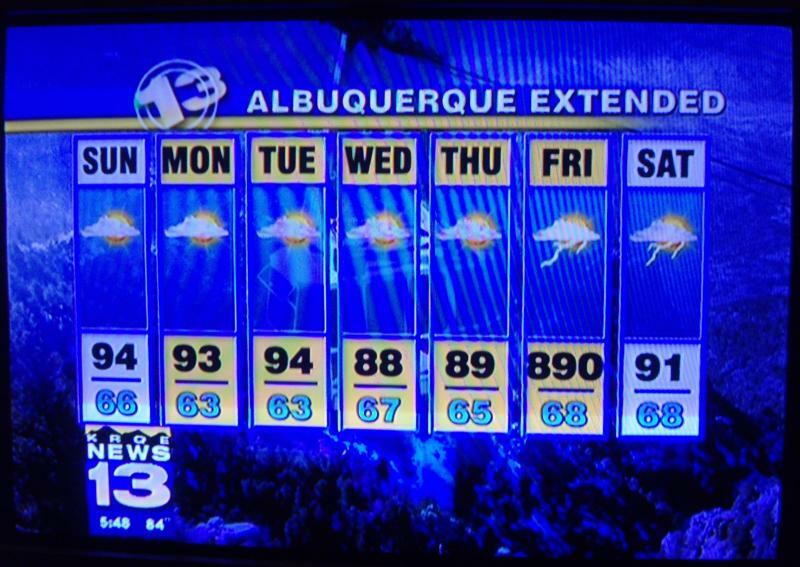 News at 10:00 Albequerque hits 890 degrees. Vulcans land at nearby airport, bringing Warp Drive technology to man. Albuquerque is exquisite, but WAY too cold for me. The mountain views are astounding. I think it might just be a typo? I live in Santa Fe. An hour or so ago we got a typical summer monsoon rain shower that cooled everything down from the low 90s to the mid 70s in about 30 minutes. In my view this has been a rather cool summer. A couple weeks ago I had to wear a sweatshirt in the house to stay warm. We get some hot, dry summers and some cool wet summers. This one seems to be just a little cooler than normal. One summer I took a vacation to Michigan in July and felt like was in a sauna the whole time. I came back and felt chilled (but I had a great garden that year). “……..On NH’s main commercial TV station, the AM news reported “Victim in fatal car crash improves.” There were two “victims”, they weren’t talking about the dead one. This could be an omen. Remember that Dec 21, 2012 will happen on a Friday! I believe I’ve reached a ‘tipping point’ as well, at 4:50pm this Friday! Me thinks it’s time to head down to the beach, crack open a cool Killian’s Red lager, with a Dewars scotch on the side, and just contemplate my toes and the entropy of naval lint! Suggest Y’all do similarly….. and Thanks for the Grin! I’ll put on my SPF 1000, just to be safe! Tippy Canoe and Mac the Knife Too! Might check the placement of their MMTS. Punks set the Stevenson screen on fire again. That’s more than UHI can explain. Maybe GISS homogenized with Roswell. Sandia was calibrating their new EMP simulator. Yes, but we’re more concerned with the anomaly than the absolute temperature. According to the wonks at the debate, we just need to be like Mars to be cool….so let’s remove all of our atmosphere EXCEPT the CO2 and we will be cool as a cucumber. That’s not warm to me…. Surely you are not suggesting that they should ignore inconvenient data? That’s called cherry-picking! Quite possibly it’s Alamagordo and area 51 going into nuclear meltdown. I’m taking a break from my database class and I needed a good laugh. Lots of laughs in this thread. My favorites are the Lucifer/Friday one and hottest July in 4 billion years. It’s caused by poor siting yet again. Never, ever, put a thermometer on the end of a lightning strike, or you will get poor quality results. hmmm….the surface temperature on Venus is 896 F, so the only thing this can possibly mean is that HANSEN WAS RIGHT!!! See page 22, “The Venus Syndrome”!! TiVo is a big help, too. There have been a number of wildfires in the Southwest this year, but not as many as in past extreme years. The onset of the monsoons is a welcome respite and drenching of current fires. Lightning with ample rain is not the dangerous wildfire igniter that dry lightning is. For a great (near) real-time lightning map, I recommend the Vaisala Lightning Explorer which uses data from the National Lightning Detection Network. Baby I’m tooooo… too hot to handle… too hot to handle !!! Hell is freezing over and the heat had to be hidden somewhere. Drunken dendrochronologist drills hole in patio heater. Discovers new temperature record. 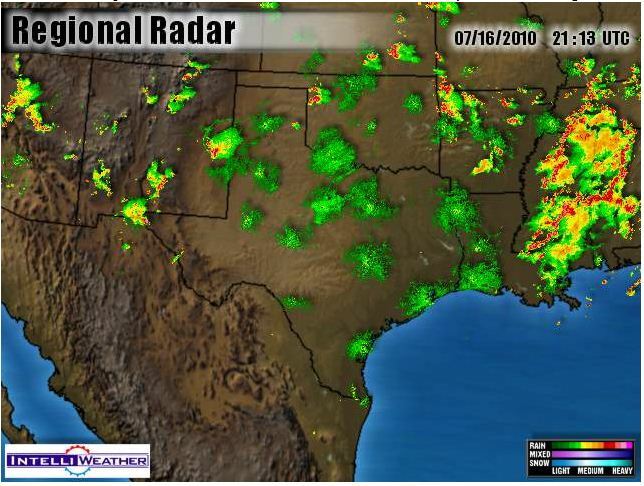 Also opportunity for enhancing weather graphics and automation. The lightning does look a little longer in the Friday graphic, but really needs to be replaced with something more appropriate like a heat ray, or GISS logo. And.. if you lot would adopt a sensible temperature scale like celsius, this would be less likely to occur. Then, if you needed more than 3 digits, please refer to the senior meteorologist to unlock it, or slap some sense into you. AH HA, NOW we know where NOAA gets all that funny data!! Great Fun!! I love the remarks. I would contend that this is a natural result of Boyle’s law. Obviously an increase in the number of politicians in Albuquerque caused a tipping point to be reached in the forecast model, where the reaction achieved a criticality event, causing political B.S. to spin out of control. The model, therefore, correctly allowed for this. The same phenomenon is allowed for in the East Anglia models. Since politicians travel a lot, they have to allow for their removal from areas, thus temperature adjustments must be increased when politicians move from their home areas, to allow for the reduction in production of Political B.S. I saw both shows, what a band! Great anthem for the anti-AGW crowd! The weather’s gone berserque in Albuquerque. It’s Thermogeddon, and I’m not kiddin’. They told us, but we wouldn’t listen. We thought the science was crooked. Prior to Anthony’s visit to Perth, a TV reporter at the local station of the national broadcaster (ABC Australia) remarked that some people had been brave to venture outside as the barometer plunged into negative territory. …. Jogging through the event horizon …. Totally awesome! I was going to put that one in there, don’t know why I didn’t… Quite an interesting story of the Schenker brothers and the Scorpions vs UFO. While Scorpions may have had the commercial crowd, UFO is what I grab when I wanta rock. Love it! Michael Scenker remains in the top 50 performances of all time Guitar Magazine with Rock Bottom.